Druk Path Trek is one of the shortest, finest, and the most popular trek in Bhutan. It offers a chance for trekkers to experience the mesmerizing beauty of natural landscapes, snow-capped Himalayan peaks, pristine lakes, high ridges, and blue pine forests. Not only that, the trekkers will also get the opportunity to see some ancient Lhakhangs high up in the mountains and visit Jele Dzong. It takes around 6 days to complete Drukpath. As the trek begins at high altitude it is advisable to stay a couple of days in Paro or Thimphu prior to the trek to acclimatize. On day 3 for the trek, you will come across Jimilang Lake (Jimilang Tsho) where you will observe the sacred lake. This lake is a home to huge trouts and you may even get to see the local people fishing with bamboo spears. Day 4 of the trek brings you to two other lakes; Janye Tsho and Simkotra Tsho with the night’s campsite located just above Simkotra Tsho. In addition, you will also get a chance to observe a spectacular view of Mt. Gangkar Puensum, which is the highest unscaled peak. 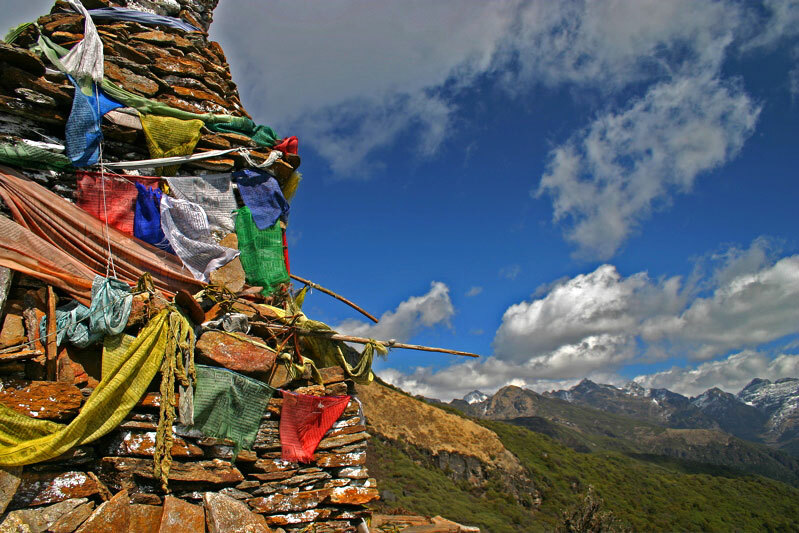 The next campsite located at Phajoding is within proximity to the Phajoding Monastery which would be a worthwhile visit. The best times to go for a trek in this trekking route are either March-June or September-November. This trek spans a total of 14 days with more than 125 miles to cover. For this trek, altitude gain is estimated at 17,000 ft and altitude loss at 23,000 ft. Although considered as a moderate trek, this route is for trekkers that are looking for some serious challenge. Jomolhari means Goddess of the Sacred Mountain. According to records, it is said that Jomolhari is the perfect mountain that appears to be symmetrical when viewed from a distance and hence fit to be the throne of a goddess. The Jomolhari Laya Gasa Trek is one of the finest treks in Bhutan. You will come across amazing unspoiled landscapes in Bhutan, subtropical jungles, high mountain passes, and gorgeous alpine meadows in your way. During the trek, you will also get a chance to observe indigenous animals, like Takins and blue sheep. After a few days of trekking, you will be traveling through remote mountain villages where you will meet people of Laya with a unique culture, appearance, and tradition. Overall, this spot will offer you an ultimate trekking experience. However, a beginner will find it difficult to deal with high altitude and steep ascents and descents. Talking about the best time to trek, you should complete this challenge in April-May or Mid-September to Mid-November. The Lunana snowman trek is possibly the most strenuous yet rewarding treks around the Bhutan Himalayas. The Lunana Trek is also known by trekkers as Snowman Trek, Jhomolhari Trek, Laya Trek; which are in fact just different variation of the trek as there are multiple entrances and exits throughout the journey. The longest version spans from Paro to Jhomolhari, Lingshi to Laya and eventually through Lunana and Nikachu. The trek is essentially made strenuous because of the long journey, weather conditions, high altitude and remoteness of the districts traversed. It is imperative that a trekker is physically fit, fully equipped and guided with local expert trekkers during this trek. 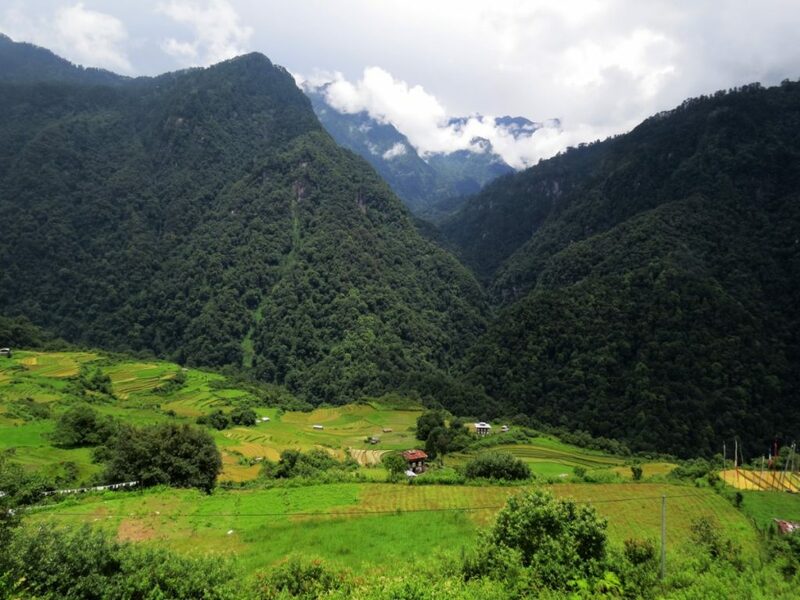 Lunana remains as the most untouched district of Bhutan as the country has been unwilling to open it up due to the inaccessibility and high possibility of natural hazards. You will experience a trek that is heavily forested observing animals such as Takin, Blue sheep Marmots, Musk deer, and various species of birds along the trail. During your journey, you get panoramic views of Bhutan Himalayan mountains such as Jhomolhari and Gangkhar Puensum. You may also get to interact with the Laya semi-nomadic tribe people giving you a unique experience. This trek will truly be your once in a lifetime Himalayan adventure.